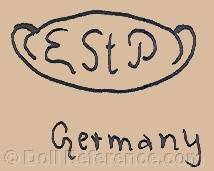 The (First) Erste Steinbacher Porcelain Factory was founded in 1900 by Max Kieswetter in Steinbach, near Sonneberg, Germany, by 1902 Mr. Hugo Zucker joined the firm as a co-owner. 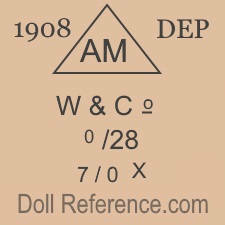 From 1900 until 1912 the company doll mark was the initials EStP, as shown on left. 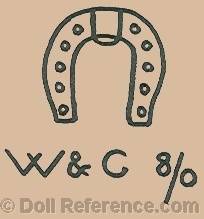 In 1912 the company was sold to Hugo Wiefel and renamed Wiefel & Company, thus a new doll mark was used of W & Co. or W & C, sometimes with a doll mold number. 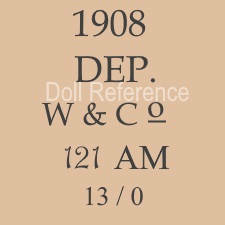 By 1914 Wiefel's manufacturing was shut down for World War I and restarted up in 1918, although it doesn't appear that doll heads were resumed being made until 1923. 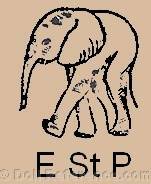 In 1923 Robert Carl and his son-in-law Gustave Heubach became silent partners in the firm and the company was renamed Erste Steinbacher Porzellanfabrik Wiefel & Company KG. and doll heads were again being made. 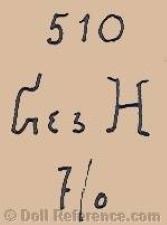 Gustave Heubach used the doll mark GH, G & H, as shown far below. 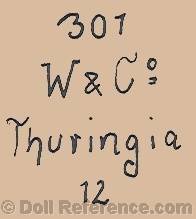 Mr. Wiefel left the company in 1926.